These beautiful keepsake necklaces & bracelets go above and beyond a thoughtful gift. Custom touches make this jewelry memorable and a wonderful way to take your loved ones with you everywhere you go. Choose from any of the beautiful styles, metals & stones below for the perfect personalized keepsake piece. *Rush orders possible for holidays. Normally, please allow 2-3 weeks for jewelry to arrive. This popular necklace is a great way to show off your family in silver, gold or both! Striking in its simplicity, this piece celebrates the perfect & not so perfect things in life. Comes in all birthstones. Not only stylish, this handmade necklace is safety tested for baby to teethe & play. Comes with one, two or three rings. Add a personal touch and engrave names, dates or sayings! This sweet necklace is great for moms with two, three or ten little ones to love. Get your personalized discs in silver, gold or both! 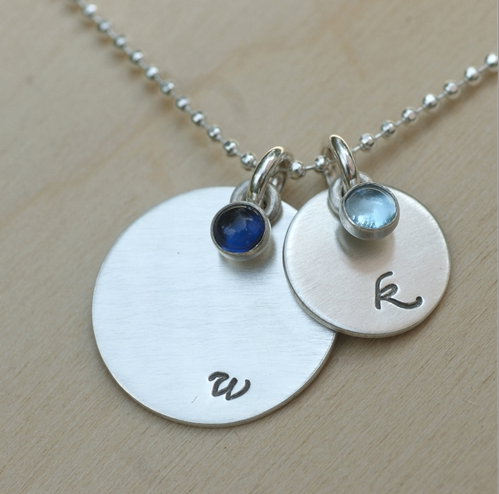 A modern way to symbolize you and your loved ones, featuring cursive initial stamps. Also comes in 14K gold. What better way to celebrate the special man in your life then with personalized cufflinks. Comes with one or two initials or a name in small font. A modern twist on an elegant classic. Moms and grandmas alike will love to sport this great accessory. Add as many names & birthstones as you like. This gold rimmed disc is an elegant mix silver and gold that will match all the jewelry! The striking and ever popular Life Circle necklace with birthstones in 14K gold. These 14K discs are an amazing keepsake for mom and grandma. Names just not enough? 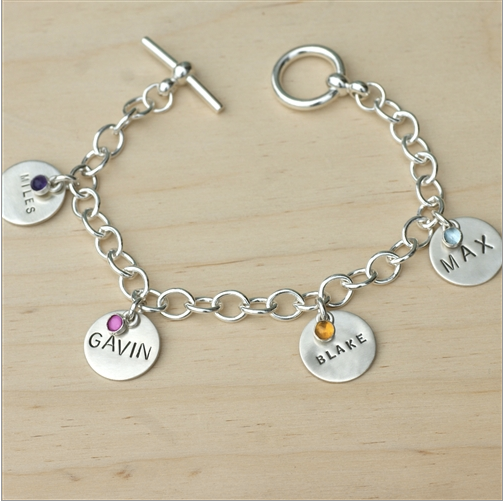 We can add birhtdate, initials and birthstones too! Not just another elegant bracelet! This handmade bracelet is safety tested for baby to teethe & play. Comes with one or two rings. Add a personal touch and engrave names, dates or sayings! A symbol of comfort, home and blessing, the sterling silver nest necklace can be personalized to include birthdates & initials.